← The Great Food Blogger Cookie Swap! Little snowballs of chocolate heaven — what more do you need to know? The powdery sugar coating cracks in the oven to reveal the fudgy interior. They’re as moist and deeply chocolate as a brownie, but lighter in texture; they really do melt in your mouth. This was my mom’s recipe. When I was single, I made these every Christmas, often in multiple batches. They were my go-to cookie for serving and giving. But when Luke was little (okay, until last year), it was more fun to make and decorate sugar cookies. I’d kinda forgotten about these cookies. But then I participated in the Great Food Blogger Cookie Swap. 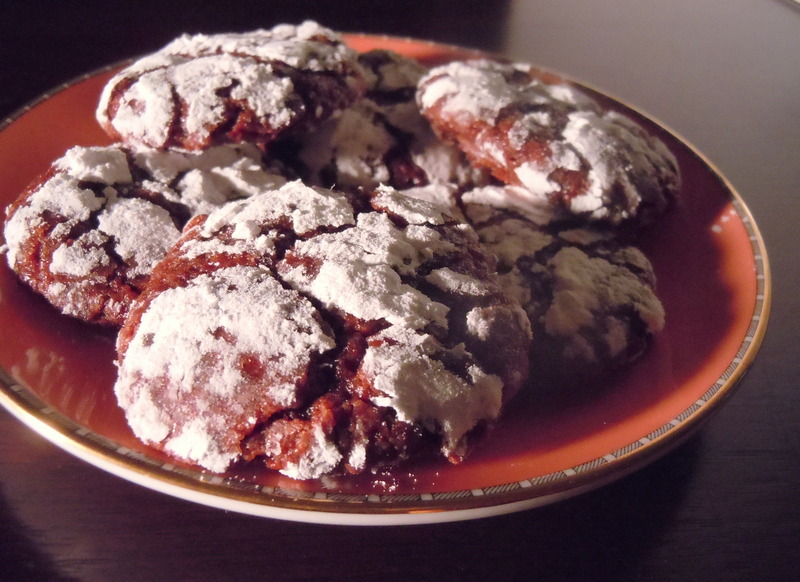 I didn’t make chocolate crinkles (instead I made these), but a few of the participants made their versions of confectioners’ sugar-dusted chocolate cookies. I searched out my recipe, deciphered the faded writing, and got to work. Since I hadn’t made them in years, I made a half batch, with a few tweaks: I lowered the sugar by 2 tablespoons (my mother likes sweeter cookies than I do, and it seemed like an awful lot of sugar), and I doubled the salt but used sea salt, not the iodized table salt from the original recipe. The result, if I say so myself, was delectable. The cookies were sweet without being cloying, and there was just enough salt to enhance the chocolate. Break the chocolate into pieces and place in a small microwave-safe bowl. Microwave for 30 seconds. Give the chocolate a stir and continue microwaving for 30 seconds at a time, stirring in between, until the chocolate is just melted. Set aside to cool for a minute. While the chocolate is cooling, beat the oil and sugar together. Stir in the chocolate until well mixed. Beat in the eggs one at a time, then stir in the vanilla. Stir in the dry ingredients just until well combined. (I did this all with a wooden spoon; you certainly can use a mixer, but it isn’t necessary with this recipe.) Cover the bowl and refrigerate the dough for at least 2 hours until it’s firm; you can leave it in the fridge for a full day if you wish. Heat the oven to 350 degrees F. Line a cookie sheet (or two) with parchment. Put the confectioners’ sugar in a shallow bowl. 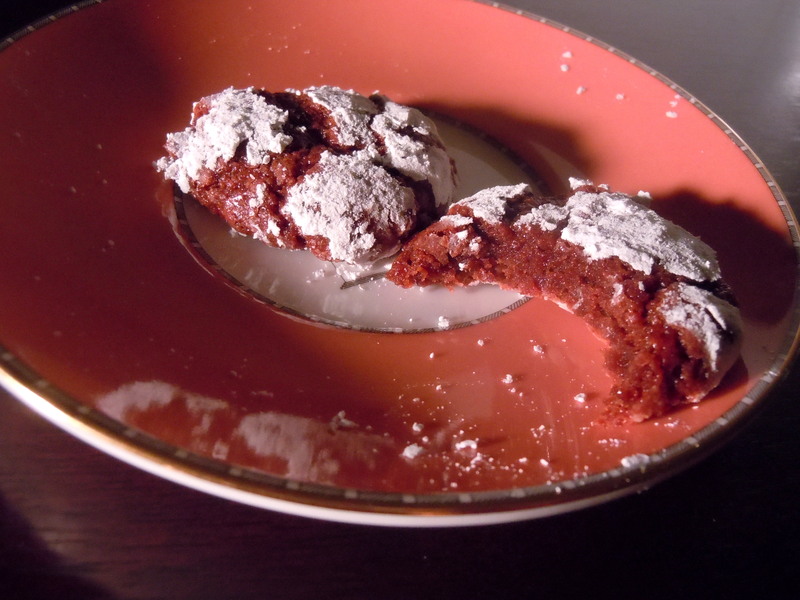 Roll the dough into 1-inch balls (rounded teaspoonfuls) and drop them into the confectioners’ sugar. Don’t overcrowd them. After you have several in the sugar, roll them to cover completely and transfer them to the cookie sheet, about 1 1/2 inches apart (they don’t spread too much). Bake for about 8 minutes, until the chocolate peeks through cracks in the sugar, and they look less shiny. Don’t overbake. If you bake two cookie sheets’ worth at a time, rotate the sheets halfway through. Cool on a rack, then store in an airtight container once they’re at room temperature. They’ll keep for several days, but are best on the first day. This entry was posted in baked goods, sweet stuff and tagged chocolate, cookies, holiday. Bookmark the permalink. Thanks, Teresa. They really are a snap to make.